F processing emphasizes specific fineness. 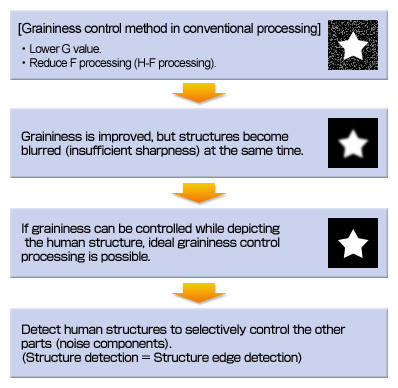 HF processing emphasizes multiple fineness types. HF processing has more variations in emphasis degrees and patterns. Konica Minolta provides HF/HE processing called “hybrid processing” as a standard function, which is an upgraded version of conventional frequency processing using multiresolution decomposition. Conventional emphasis processing in CR focused on two points: correcting the image density of the difficult-to-see part and emphasizing image sharpness. Conventional image processing was outlined on the previous page, and now, image processing capable of improving image speckling (noise) is debuting. Improved images of the body part concerned with distinct noise. Improved image quality in low-dose exposure. Improved diagnosis capability and suppression of noise to depict borderlines clearly. HS Processing is an image processing method that reduces intrinsic image noise. It is a hybrid processing technology developed to increase image graininess and optimize the balance between contrast and noise in the image at the same time. 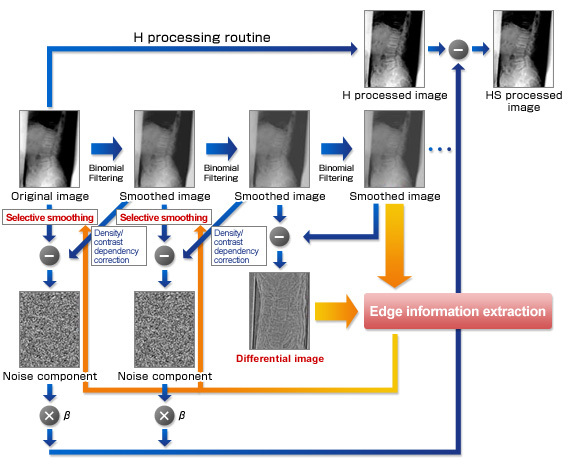 Decreasing the response of non-edge (noise) components after recognizing edge components in the “multi-resolution decomposition” process of hybrid processing improves image graininess. Now we will explain the details of suppressing noise to improve graininess. Before explaining concrete processing, let’s consider a method to improve graininess. Hybrid processing (HE/HF processing) uses frequency processing with multi-resolution decomposition that is capable of emphasizing, depending on the degree of detail in a structure (frequency in an image), while HS processing improves graininess by selectively reducing fine noise in an image. X-ray pictures copying the human body consist of collective structures with different degrees of fineness, the image can become very clear by extracting the edge part of each fineness (multi-resolution) and adding or subtracting it from the original image as needed. The following three processes, known as image speckling, are added to the hybrid processing routine using multi-resolution decomposition, as explained in the previous section, to improve graininess. Extract edge information from multiple smoothed images and smoothed differential images after multi-resolution decomposition. Switch smoothing filters based on extracted edge information and retain edge components smoothing only noise components. Suppress smoothing of high density/high contrast parts more than smoothed images. By recognizing the structure components as edge structures and applying selective smoothing, signals with reduced noise components are eliminated while retaining structure components. The following three processes known as image speckling are added to the hybrid processing routine using multi-resolution decomposition, as explained in the previous section, to improve graininess. Retain edge components and suppress only granular components. 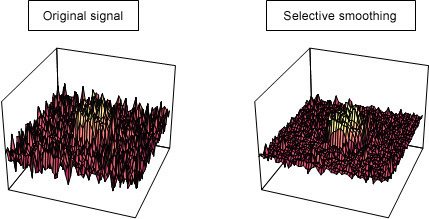 Setting the optimal balance between noise and contrast depending on the diagnostic purposes. More optimization is possible with simultaneous use of other hybrid processing groups (HE or HF).